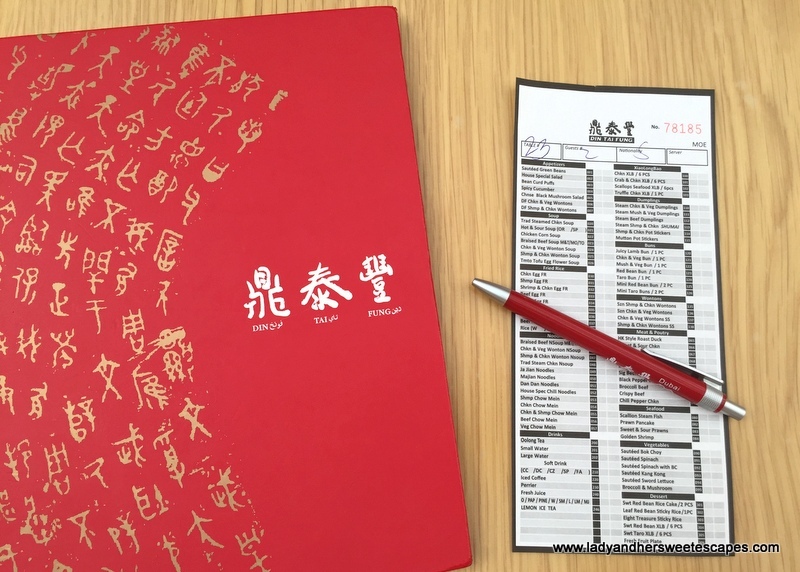 I guess Din Tai Fung needs no introduction. 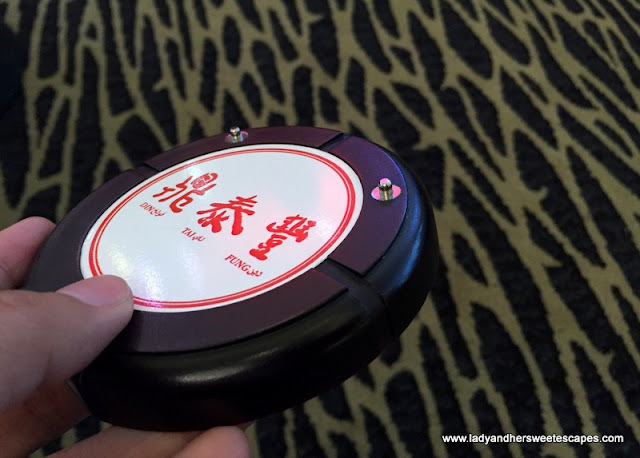 The Taiwanese restaurant rocked Dubai's dining scene last year and this blog post is very much long overdue. At one point, I have actually decided not to write about it as it has already been getting the rave it deserves. I felt that my little voice in the blogosphere wouldn't give justice to this world-renowned dumpling place. 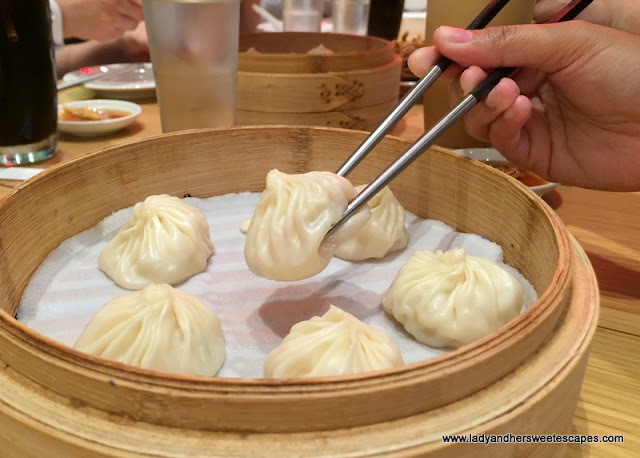 But every after meal in Din Tai Fung in Mall of the Emirates - the first branch in the UAE, I always get the itch to share its goodness! So, today, while looking at a photo of the yummy XiaoLongBao on my phone, I decided to finally sit in front of the computer, gather all the photos that I took in DTF, and choose 7 dishes that I can recommend (based in my humble point of view) for your next visit. First things first, let's talk about the service. Din Tai Fung is famous. The New York Times featured it as one of the world's top restaurants in 1993. The Daily Meal ranked it as #1 in the "101 Best Restaurants in Asia" in 2013. And it has 1 Michelin Star under its belt since 2010. So, I was never surprised with the queue in the restaurant's front desk, not with the long waiting time either. We usually wait for an hour to get a table. But once seated, everything's smooth sailing. Menu and order sheet (where diners can personally tick the food item) are given. It's a busy restaurant, yet the wait staff always finds time to attend the queries and to recommend the best sellers. 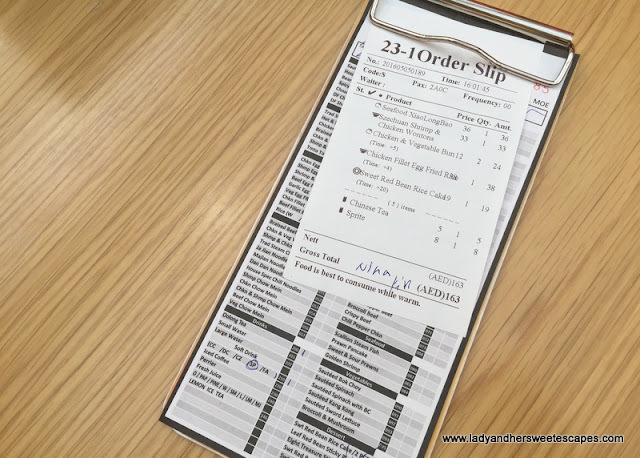 Once the order is taken, an order slip which looks like the food bill is placed on the table. This doesn't mean diners have to pay ahead. So don't be offended. It's more like a checklist for the staff and for the diners as well. With that, it's easier to check if everything's served and to follow up whatever's missing. Patience is a must in DTF! I waited for an hour for this pager to light up. 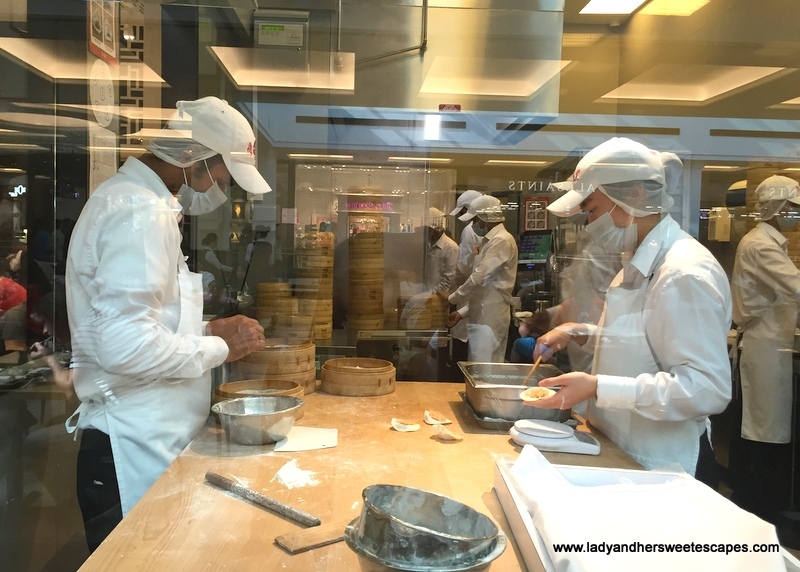 Diners can see how the dumplings are made in Din Tai Fung's open kitchen. 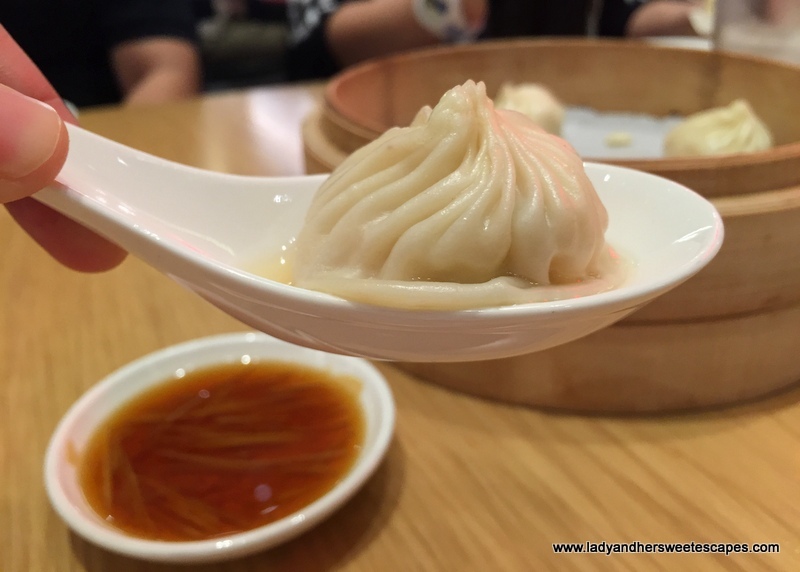 XiaoLongBao is Din Tai Fung's specialty. It is not just another kind of dumpling, it is a special one! XLB is a soup dumpling - the delicate wrapper seals a hearty serving of rich broth and flavorful filling! 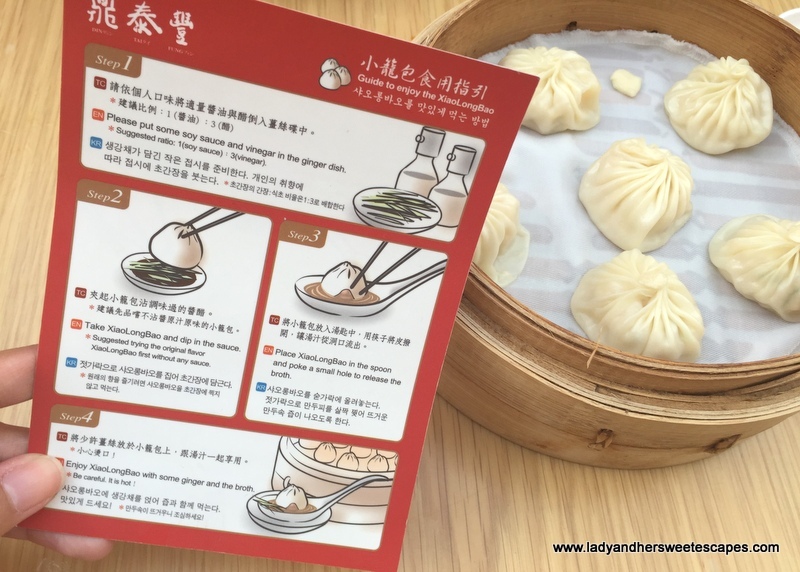 It is best to carefully follow DTF's guide to eating XiaoLongBao... or else you might burn your tongue and hate XLB for the rest of your life (but I highly doubt that). There are four varieties offered in DTF - Dubai and my favorite is the Crab & Chicken XiaoLongBao. It has a savory nugget of minced crab and chicken and piping hot soup tucked in a melt-in-your-mouth wrapper. Yum! 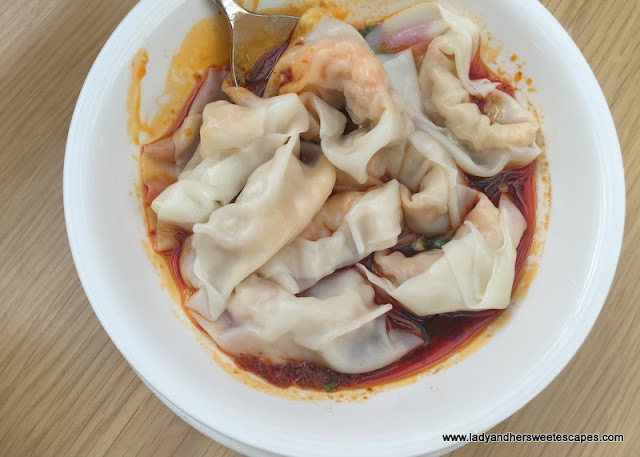 Din Tai Fung's Szechuan Shrimp and Chicken Wontons is a dish of flavorful wontons armed with a kick of spice. I'm not into spicy food, but I love the sweet zing that comes from the Szechuan sauce. It's a perk-me-upper! Don't underestimate this simple-looking noodle dish! Din Tai Fung's chow mein is bursting with flavor and aroma. 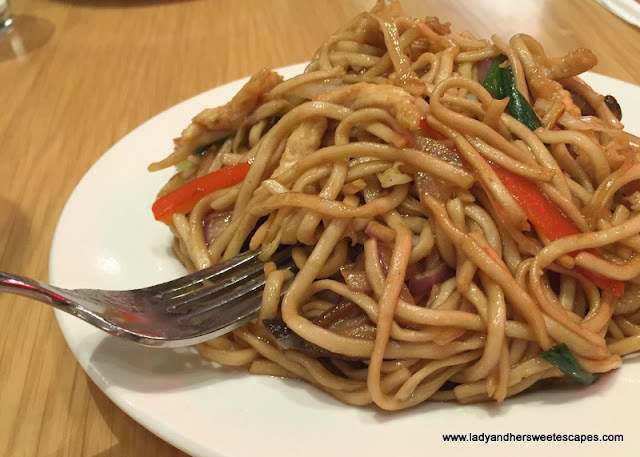 The stir-fried noodles, vegetables and thin chicken strips were tossed in a subtle yet rich sauce. Despite looking so basic, it has an impressive taste that actually made me wonder how it was cooked. 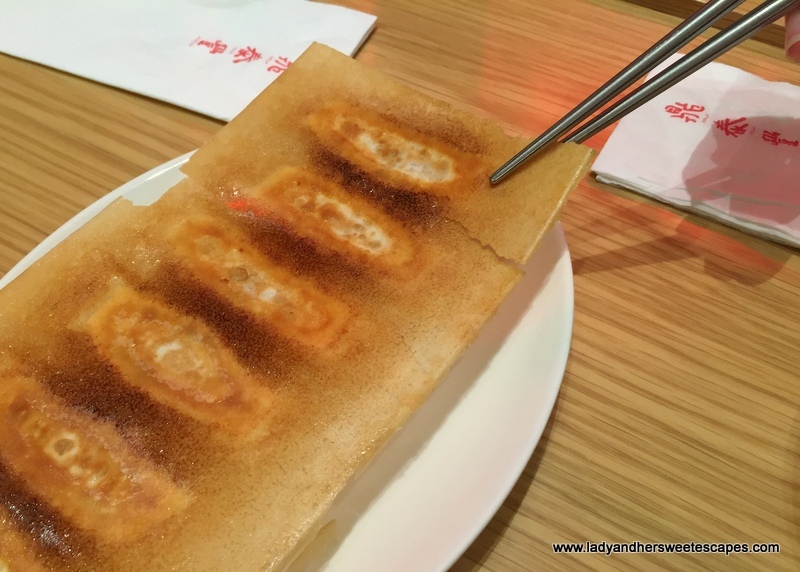 Another kind of dumpling not to be missed in Din Tai Fung is the Pot Stickers. It is a pan-fried dumpling served attached to each other, presented upside down. Break the thin crispy skin between each dumpling, then it's ready to share! What made this dumpling different from the others is the unique blend of textures; crunchy pan-fried layer at the bottom, silky steamed layer at the top, soft meaty filling in between. Din Tai Fung is not just a place for dumplings, meat dishes are offered as well. 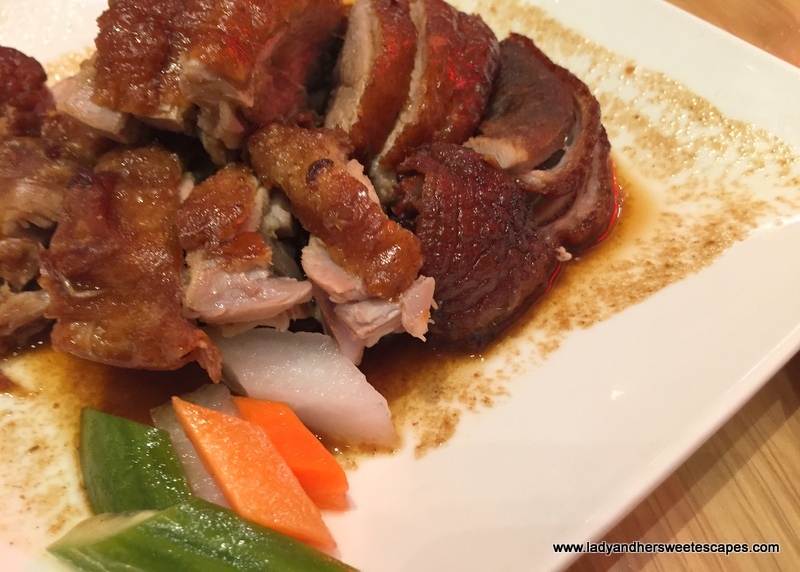 A fave in the meat and poultry section is the Hong Kong Style Roast Duck. It's a dish that is perfect for a group of friends or family to share. The meat is tender, the skin is richly browned, and the sauce is dark and scrumptious! Of course, best when paired with rice! Did I mention that this Michelin-starred restaurant is budget-friendly? 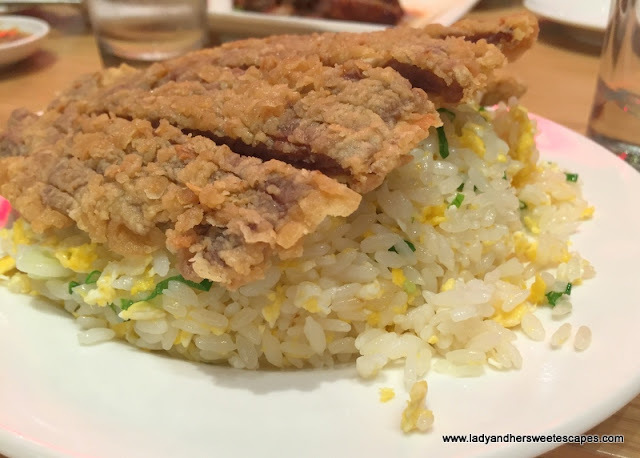 If you're a rice person and you're dining alone, there's no need to order a main dish as Din Tai Fung offers fried rice that comes with a huge fillet of beef or chicken! Yes, like a combo meal - flavorful, filling and not pricey! For dessert, the sweet XLB sounds tempting especially if you've started your meal with the savory one. But, the Sweet Red Bean Rice Cake is a more interesting pick. 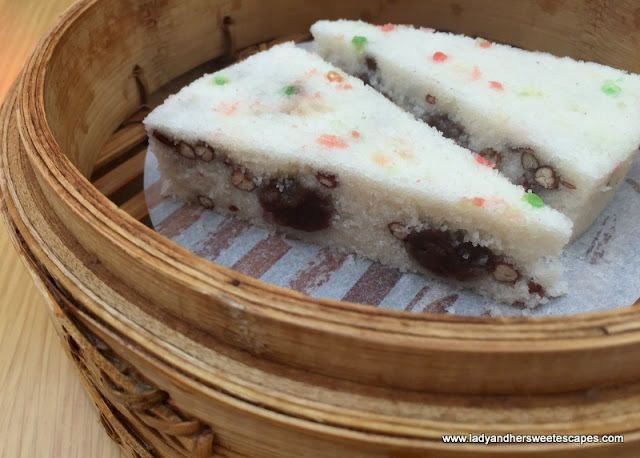 It is a spongy glutinous rice cake dotted with red bean chunks and lightly sweet red bean paste. It is made of rice, hence a little heavy on the stomach. Pair it with a steaming hot cup of Oolong Tea plus a good conversation, and you'll wonder where the two slices went. Okay! Time to exchange notes. 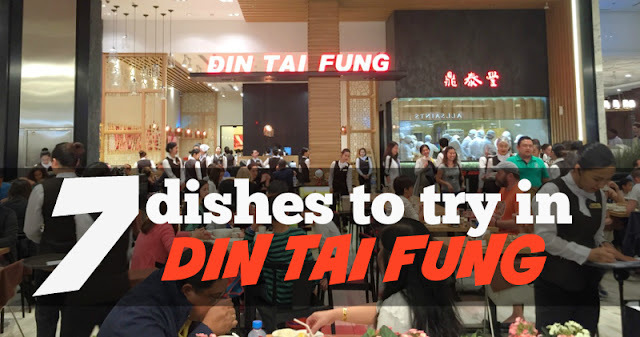 :) Tell me what you like or maybe what you don't like in Din Tai Fung in Mall of the Emirates in the comment section below. I'd probably drop by again soon, so I would love to hear your recommendations too!